This is a sampler, using the word in its original sense of a model which could be consulted when choosing patterns and stitches. 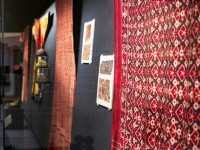 It provided a record of over fifty patterns and motifs or embroiderers to copy. We do not know whether it was made for use by professional embroiderers in a commercial workshop or in a private home in the women’s quarters to supply the household. 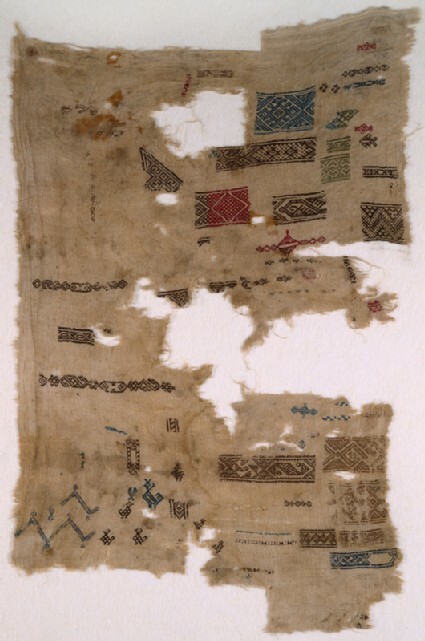 Compared with the one or two in other museums, the Newberry collection is fortunate in having over thirty samplers from Egypt dating from the medieval Islamic period. They range from those with many examples of patterns to others which merely demonstrate how to work a corner. On most of them, including this sampler, only the absolutely essential part of any repeating pattern is given, so in some cases it appears to have been cut short. Here all the patterns are worked in pattern darning in running stitch, which is the one found most often on the Newberry pieces. The embroidery on a quarter of the whole collection is worked in pattern darning, and over half of this is on bands. It appears that in spite of it being such a labour intensive technique, it was commonly used to decorate a variety of items of light clothing, household linen and furnishings for everyday use over a long period. 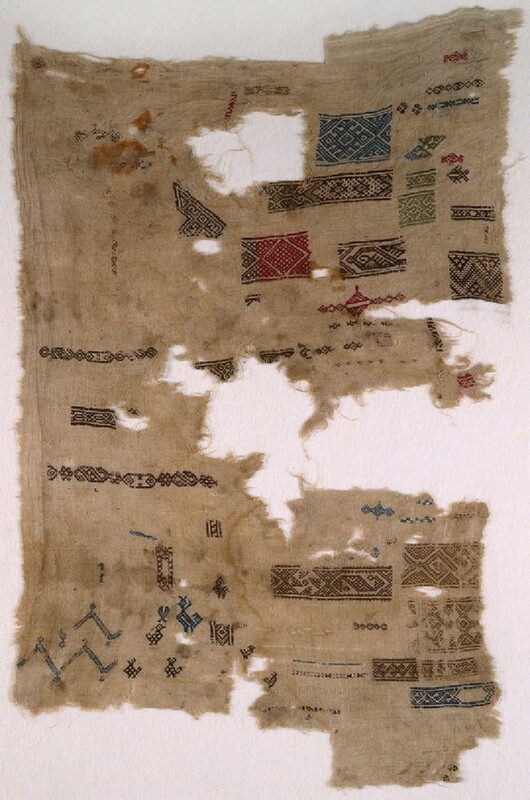 Many of the geometric patterns include design elements like the elongated hexagons, diamonds, S- and Z-shapes and whirling rosettes seen on this sampler which appear again and again in slightly different permutations. Zigzag designs, too, are common, especially ones with little pendants. Small bird motifs appear comparatively frequently on tunics, usually arranged in pairs or as an all-over pattern in offset rows within panels like those motifs on the child’s tunic, No.17 [EA1984.353]. A sampler with bands and rectangles, chevrons, birds and fish. The design bands are all different from each other, although they play on variations of diamonds and S-shapes. Along one long edge is a selvedge. The sampler has been radiocarbon dated to 1155 +/- 50.